This holiday season, take a stroll through a winter woodland fantasy with these 11 fabulous crochet afghan patterns from AllFreeCrochetAfghanPatterns. Take a stroll through your own enchanted forest as you browse these bright and bold designs, then make your favorite (or favorites, if you’re feeling extra crafty) to give your home a rustic and whimsical feel. These woodland-inspired designs feature earthy tones and plush yarns to provide you with cozy warmth and comfort all year ’round. Whether your idea of woodland comfort is a remote cabin trip, a fall hiking journey to admire the changing leaves or a simple walk through the park, you’ll find your perfect design here. 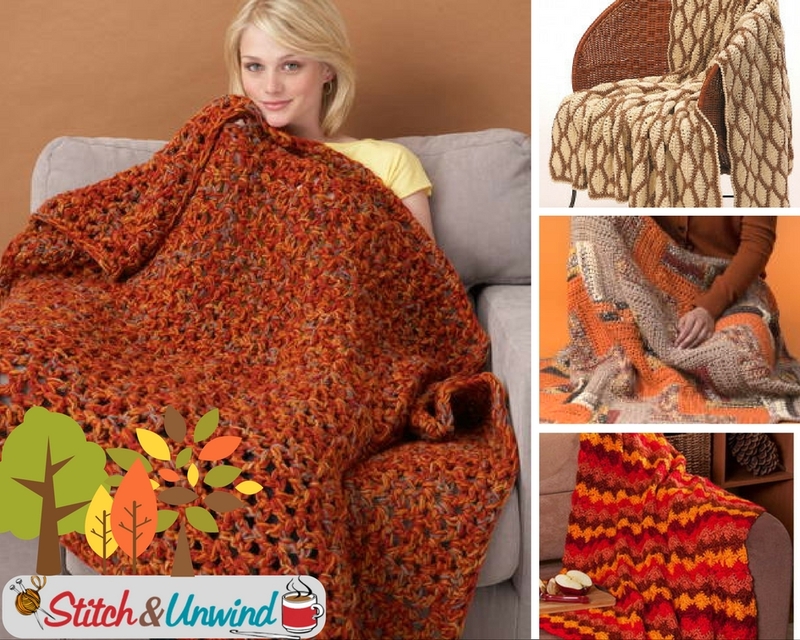 These designs, though all earthy and autumnal, are all different and good for crocheters of any skill level. Whether you’re after a simple granny square design or something featuring the ripple stitch, you’ll “fall” in love with these whimsical ‘ghans. There’s even a fantastic Catherine wheel design in there if you’re feeling particularly adventurous! Fall Weekend Throw -This fall (or winter) throw is perfect for curling up on the couch and relaxing with – plus it’ll take you no time to work up! Cozy Cabin Afghan – When you’re planning a quick holiday getaway, be sure to pack this cozy design. Log Cabin Afghan – You can’t get much more rustic with this log cabin afghan design! Falling Leaves Autumn Afghan – If you like to hike through woods of changing trees, this autumnal beauty is perfect for you. Woodland Fern Afghan – This design features granny squares with green motifs, just like random ferns growing in a forest. Into the Woods Afghan – The colors and ripple design of this crochet blanket make this an easy, calming pattern to work up. Chestnut Ripples – Use warm neutrals and a rippling design to create this cozy blanket pattern. October Autumn Leaves – Reminiscent of colorful leaves littering the ground, this cozy design is worked up in large granny squares for a make-anywhere project. Harvest Crochet Afghan – These muted autumn colors will take you into winter and beyond. Plus, the uneven design is really fun to work up! Happy Harvest Throw – Take the above design and brighten it up – this granny square pattern features bright and vivid autumn colors to spice up any living room. Amazing Autumnal Throw – Worked up in rows of wheel stitch, this bold design will take you back to sunsets on your cabin weekend. And for more Woodland Wonders, be sure to check out this collection of 13 designs today – they’re so cute! What’s your favorite outdoorsy thing to do?